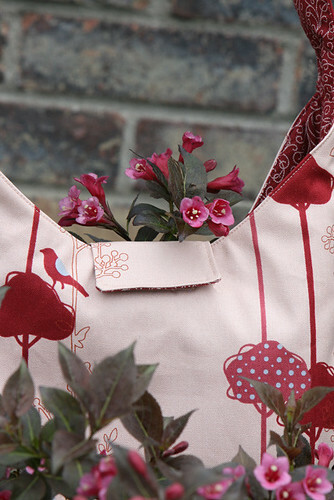 I have made this bag once before with the button closure. My Aunt saw mine and asked if I could maker her one too. I've learned a lot since I made my last one -- I didn't even bleed this time! Hers also has a velcro closure. I hadn't done one of those before, but it turned out nicely. 1- Cut the seam allowance out of the fusible fleece interfacing. This made the seams lay nice and flat as well as made the finishing SO much easier. Last time the finishing was a nightmare; I had to top stitch through two layers of interfacing as a result of the seams folded down. 2- Put a color match thread for the outside fabric on top of the machine, and a different color in the bobbin which matched the lining fabric. Looks so nice! 3- I did not put pockets on the outside of the bag this time. I think the exterior fabric looks best without pockets covering up. It has a more clean look. I put two big pockets on the inside though. *Read about the first version of this bag.